Design and evaluation of features for the characterization of (student) music performances and create models to automatically assess these performances, detect errors, and give instantaneous feedback to the performer. Automatic drum transcription in polyphonic mixtures of music using a signal-adaptive NMF-based method. – Wu, C.-W.; Lerch, A., Drum Transcription using Partially Fixed Non-Negative Matrix Factorization With Template Adaptation, in Proceedings of the International Conference on Music Information Retrieval (ISMIR), Malaga, 2015. – Wu, C.-W.; Lerch, A., Drum Transcription using Partially Fixed Non-Negative Matrix Factorization, Proceedings of the European Signal Processing Conference (EUSIPCO), Nice, 2015. 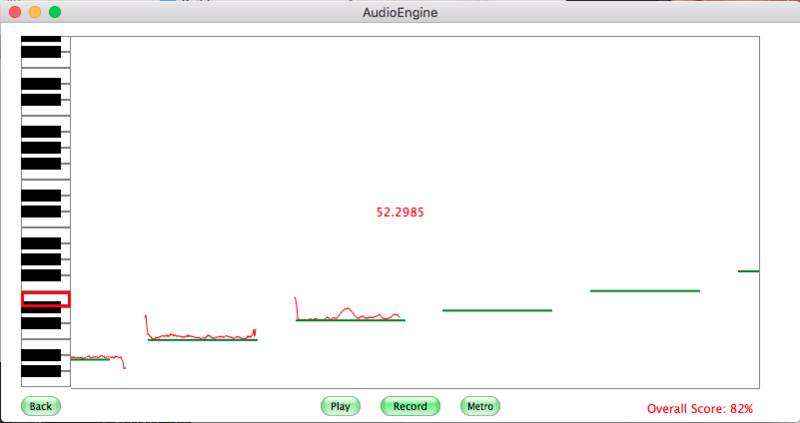 Web application to improve audio quality of low quality recordings (especially for low quality mobile phone recordings). Processing steps include detecting and correcting clipping (distortion), removing noise, normalization of loudness, and equalization. The REPAIR Web App allows users to upload low-quality audio and download the improved audio. Unsupervised detection of anomalies in music datasets. Automatic identification of continuous recordings of musicians practicing their repertoire. The goal is a detailed description of what and where they practiced, which can be used by students and instructors to communicate about the countless hours spent practicing. Machine listening provides a set of data with which music can be synthesized, modified, or sonified. Real time audio feature extraction opens up new worlds for interactive music, improvisation, and generative composition. Promoting the use of machine listening as a compositional tool, this project brings the technique into DIY embedded systems such as the Raspberry Pi, integrating machine listening with analog synthesizers in the eurorack format. – Latina, C., Machine Listening Eurorack Module, MS Project Report, Georgia Institute of Technology, 2016. Sampling, the usage of snippets or loops from existing songs or libraries in new music productions or mashups, is a common technique in many music genres. The goal of this project is to design an NMF-based algorithm that is able to detect the presence of a sample of audio in a set of tracks. The sample audio may be pitch shifted or time stretched so the algorithm should ideally be robust against such manipulation. Online resources for tasks related to music information retrieval and machine learning, including matlab files, a list of datasets, and exercises. Based on the physionet.org challenge dataset for reducing false alarms in ECG and blood pressure signals, MIR approaches are investigated for the detection of alarm situations in the intensive care unit. The 5 types of alarms asystole, extreme bradycardia, extreme tachycardia, ventricular tachycardia, and ventricular flutter are detected. Generating a transcript of a conference meeting requires not only the transcription of text but also assigning the text to specific speakers. This system is designed to detect an unknown number of speakers and assign text to these speakers in a real-time scenario. 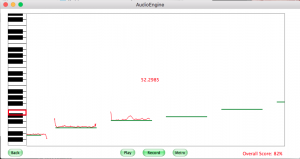 A cross-platform application for vocal training and evaluation using monophonic pitch tracking. The system is designed to take real-time voice input using standard microphones available in most mobile devices. The assessment is carried out in reference to reference vocal lessons based on pitch and timing accuracy. Real-time feedback is provided to the user in the form of a pitch contour plotted against the reference pitch to be sung. – Pati, A., An Application for Vocal Training and Evaluation using Real-time Monophonic Pitch Tracking, Technical Report, Georgia Tech, 2015. Vocopter is a mobile game adapted from the classic Copter game. Vocopter allows a playful approach to assess the accuracy of intonation. Riyaaz is an Urdu word which means devoted practice. The project aims at implementating an app that aids the practice of Indian classical vocal music. It requires the student pass through a curriculum of exercises designed to strengthen their grasp of Swara (tonality, pitch) and Tala (rhythm). The interface provides real-time graphical feedback in order to help improving their skills. A painting is an expression frozen in time. It is the imagination of the viewer that paints the untold past and the future of the captured moment. This project is an attempt to induce movements in a painting evoked by sounds or music. The idea is to extract various descriptors from music, for example, onsets and tonal content, and map them to a function to process an image and bring it to life as well enhance the music listening experience. Automatic alignment of song lyrics to audio recordings at the line level. The alignment makes use of voice activity detection, pitch detection, and the detection of repeating structures. Investigation of differences and commonalities of audio pitch class profiles of different musical genres. Publication: O’Brien, C.; Lerch, A., Genre-Specific Key Profiles; Proceedings of the International Computer Music Conference (ICMC), Denton, 2015. Sparse coding allows to learn features from the dataset in an unsupervised way. It is investigated how added supervised training functionality can improve the descriptiveness of the learned features. Design of an Onset Detection Algorithm suitable for real-time processing and a low latency live input scenario. Identification of a single predominant instrument per audio file using pitch features, timbre features and features extracted from short-time harmonics. Frame-level multi-pitch detection in the time domain with locally periodic kernel functions and sparsity constraints. Automatic identification of recordings of live performance as opposed to studio recordings. Various tutorial on installation and configuration of SuperCollider on a Raspberry Pi. Playlist generation for music exploration by defining sets of source songs and target songs and deriving a playlist through metric learning and boundary constraints. Improve audio chord detection by using a Deep Network to extract the tonal features from the audio. Publication: Zhou, X.; Lerch, A., Chord Detection Using Deep Learning, in Proceedings of the International Conference on Music Information Retrieval (ISMIR), Malaga, 2015.